We can take most electronics for free from your home or small business. Our collection sites are conveniently located to many neighborhoods and municipalities in the Puget Sound area, and we accept most electronics at no charge. If you have a small amount of e-waste or a large TV, for example, and are unable to deliver to us, consider using roadie.com. Apply promo code 3R10TECH and get 10% off your first delivery. For our residential customers, our main facility is open for receiving 8 am to 5 pm, Monday, Tuesday - Saturday 8 am to 7 pm, and 11 am to 5 pm on Saturdays. Address is 5511 1st Ave South Seattle, WA 98108. Our phone number is 206-582-7100 x3 for questions. Note: on weekdays, the loading dock closest to the 5505 entrance is open for drop-offs (see Google Street View below). On Saturdays, the loading dock closest to the 5511 entrance (retail store) is open for receiving recycling. Our main site is an authorized collection site for the E-cycle WA program. Most items are accepted for no charge. Click here to see a list of what we accept for recycling at our main location. 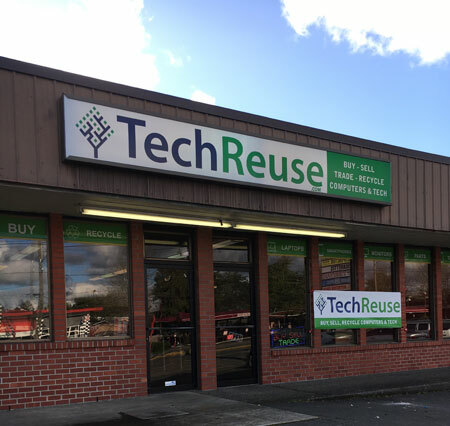 If you’re in Fremont, Ballard, Greenwood, Greenlake and further north, our partner collection site at Tech Reuse is open to receive electronics for recycling 10 am to 6 pm, Monday through Friday, and 10 am to 5 pm on Saturdays. Laptops, Desktops, Tablets, Macs, LCD Monitors, Mobile Devices, TVs, Monitors, Printer, Peripherals, and Small consumer and office electronics are accepted. Destruction services for hard drives and media may be made here directly with the staff at Tech Reuse. For our residential customers in the north end, our partner collection site at Mail Access is open to receive small electronics for recycling 9 am to 5 pm, Monday through Friday, and 9 am to 3 pm on Saturdays. Address is 16904 Juanita Drive, NE, Kenmore, WA 98028. Call 206-582-7100 x1 for more information or questions. This site is not a collection site for the E-cycle WA program. NO TVS, CRT MONITORS, APPLIANCES, OR LARGER ITEMS CAN BE ACCEPTED HERE. Laptops, Desktops, Tablets, Macs, LCD Monitors, Mobile Devices, Printers, Peripherals, and small consumer and office electronics are accepted. Destruction services for hard drives and media must be made and arranged with our main location. No destruction services are available at the north end partner location.